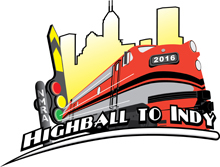 Have you sent in your registration for Highball to Indy 2016? Now is the time. You can register on the NMRA website (nmra.org), or print out a copy of the registration packet which is available on the convention's website, nmra2016.org and send that in. 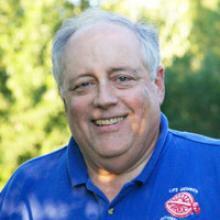 Remember that our guest speaker for the NMRA Awards banquet will be Mr. Ed Ellis, President of Iowa Pacific Holdings. Iowa Pacific is the current operator of Amtrak's "The Hoosier State" passenger train, providing four-days-a- week service between Indianapolis and Chicago. Mr. Ellis recently spoke at the National Association of Railroad Passenger's Conference in Indianapolis where he shared the story of starting up the Hoosier State/Amtrak train along with his dreams to make this a frequent and reliable manner of travel between Indianapolis and Chicago. To read about the startup, see March 2016 Trains Magazine. Also Trains Magazine in its November 2015 issue, listed Ed Ellis as one of the "75 People You Should Know Who Made Railroading and Trains What They are Today." Send in your registration so you, too, can Highball to Indy. The Layout Directory working group completed a large survey of layout owners listed in the old Pike Registry. The survey was focused on visitation problems and visitation issues with the Pike Registry in an effort not to repeat visitation problems identified in the old system. The group also solicited input from selected NMRA members as to what content should be included in the new on-line Layout Directory and how that content should be recorded and displayed. Currently the group is consulting with the NMRA's web development staff to determine how the proposed content can be developed into (1) an electronic format for recording the information about layout owners and their layouts and (2) an on-line layout directory that NMRA members (only) can access. Part of this will focus on minimizing costs associated with developing and operating this new member service. When this is completed the work is to be approved by the NMRA leadership, after which the group will solicit layout owners for the new Layout Directory. The S&C Dept. is currently working on a revision of RP-11, which recommends minimum track radius curvature based on the length and type of car or locomotive. Alex Schneider is making a significant number to changes to this RP. Now that S-7 (Clearances) includes clearances for three eras (Old Time, Classic and Modern), this suggests that S-8 (Track Centers) and RP-11 also need to be updated. Have a great layout photo? Submit it to the 2017 NMRA calendar! 1 . Take a horizontal (landscape) format photo of your layout. 2 . Submit your photo as a digital file, as a 35mm or medium format slide (100 ISO or slower), or as a 35mm or medium format color negative (200 ISO or slower). Digital files must be at least 300 pixels per inch and 8" x 10" (minimum size of 7.2 megapixels - larger is better). Accepted file types are tiff (preferred) or jpg (highest quality only). 3 . Write a caption describing the action in your shot, the scale, the builder, and the photographer. Include that information on a separate piece of paper, or as a text or .doc file on your submission CD or DVD. 4 . Please limit your entries to no more than your four best scenes. Photos must be received by July 15, 2016 for consideration. (cropping, smoke and lighting effects, etc.). Be sure to indicate specifically if you do NOT give permission to alter your images. Right now a list of railroad attractions offering discounts to NMRA members is available on the NMRA web site at http://www.nmra.org/member-discount-program. These attractions range from the Napa Valley Wine Train in California to the Baltimore and Ohio Railroad Museum in Maryland. Discounts are typically about 10%. The best discount so far is the Grand Canyon Railway & Hotel® offer of a 20% discount on hotel rooms -- that could save enough to pay your NMRA dues! Some attractions use a code for the discount, others expect you to prove your membership by showing a current NMRA membership card. The details for each attraction are on the web site. The plan is to extend this program to hobby shops. We will need the help of the members to seek out all the opportunities, you will be hearing more about this effort later. We are also looking into the possibility of discounts at several home improvement stores. As the Discount Program develops to its full potential, the hope is that a member can realize enough savings to cover the cost of membership. We would like to hear from members who find this to be the case. Some of you may challenge the need to do anything, let alone go "digital" but that ignores the old adage that nothing can stay static and that change is the only constant in the universe. For proof, just look at our hobby. It has changed over the decades and remarkably since I started in 1961. When I was a novice model railroader, brass track, block wiring, open frame motors, matte board buildings and lichen were common elements of a model railroad. Today, they have gone the way of the buggy whip in most cases. The hobby has evolved in new and exciting ways. Few of us would want to return to 1961 technology in an era of DCC, digital sound, smooth-running mechanisms and unparalleled realism. The hobby has never been more fun or rewarding, at least in my over 50 years' experience. Yet our communications and publishing remain the same as in 1961. Better edited and far better content; certainly graphically superior compared to the pulp Bulletin of my youth, but still printed, mailed and delivered in paper form. Only the NMRA eBulletin and nmra.org present a new form of communication and few complain about either. The death of print media has been projected for over thirty years now and while newspapers are slowly eroding, the end of print is nowhere in sight. I have a Kindle but prefer books, though I take the Kindle on cruises and long flights. Although I have many of the digital archives published by Kalmbach and Benchmark Publications, I continue to dutifully read their magazines each month. Perhaps I am a dinosaur but some wit did posit that few feel comfortable reading a laptop in the bathroom. There is something satisfying about a magazine that is hard to replace. But digital libraries can store an enormous amount of material in a small space with instant access. So it is hard to ignore the advantages. Why not abandon the print version of NMRA Magazine altogether and go digital? Well, we have studied doing so and continue to look at it. In 2015, the BOD was presented a report from Publications on going digital. Their conclusion was and is, that the time is not yet right. Other railroad-oriented publications offering both print and digital versions have found that only 2.5 - 4% of their readers subscribe to the electronic version. The latest ABC audited circulation figures for Classic Toy Trains, for example, one of the largest train magazines, showed a 4% digital readership. Evidence indicates that despite healthy ad content, digital magazines are questionably profitable. Few want to publish a money-losing magazine whether digital or print. We are currently surveying our members and advertisers to gauge interest in a digital magazine. As I said, the question is not IF but WHEN. So far, "when" remains an open question. So we look forward to expanding our digital presence and one day, going digital. We just can't tell you exactly when. Well that's all for now. Those are my thoughts; what are yours? The following are the official results of the 2016 election, as reported by John Stevens, NMRA Secretary. Vote tallies are shown in parentheses. The NMRA Board of DIrectors and officers would like to thank all the members who ran for office. Your willingness to serve in an elected position is greatly appreciated. 3. Regional Advisory Council (RAC) Director. Please check Section A.10.1 page A.10.1-1 of the NMRA Executive Handbook (EHB) located at http://nmra.org/executive-handbook for the extent of the districts affected. Qualifications for candidates can be found at Section A.3.1 paragraph 12C page A.3.1-4 of the EHB. All submissions of candidate's names for the Central District Director are managed by the National Nominating Committee and should be submitted to Tony Koester, National Nominating Committee Chair, nkpfan@ptd.net, no later than June 1, 2016. The incumbent is ineligible to run for reelection. All submissions of candidate's names for the Canadian District Director, NMRA Canada President, and NMRA Canada Vice-President are managed by the NMRA Canada Nominating Committee. Contact Stephen Wood, NMRA Canada Nominating Committee Chair, stephendwood@gmail.com no later than June 1, 2016. All submissions of candidate's names for the RAC Director are managed by the RAC Nominating Committee. Contact Hank Kraichely, RAC Nominating Committee Chair at hkraichely@sbcglobal.net no later than June 1, 2016. Candidates may wish to run for these positions by petition and not be subjected to the decisions of the respective Nominating Committee. Requirements for submitting by petition are contained in the EHB in Section A.10.1 paragraph 3 page A.10.1-1. All submissions by petition shall be received by the Secretary NMRA no later than September 15, 2016. Don't use car batteries to find layout shorts! Starting on page 36 of the May 2016 issue of NMRA Magazine, we printed an article entitled "Wiring for DCC, Avoiding Short Circuits, and Fixing Them if You Get Them." In that article there was a description of a method for finding short circuits using an automobile battery. Just after publication, a qualified reader brought to our attention the fact that concerns for fire or even battery explosion exist before and during the use of a high-amperage power source, such as an automobile battery, in this manner. Even if extraordinary steps are taken to prevent problems, severe risk remains. For these reasons, we do not recommend this procedure for finding short circuits. Looking for some fun? Join us on Facebook, Twitter and YouTube! The way we communicate has dramatically changed over the last 40 years. From pen and paper to the telephone to email, talking to one person has gotten faster and easier. Today there's a way to share information with millions of people in only seconds: social media. Social media is where the NMRA can easily communicate with members and potential members, and it's perfect for creating a sense of comradery and community, as well as sharing knowledge. Increasing our presence in the most popular social media (Facebook, Twitter, and YouTube) is one of our immediate goals. By continuously posting interesting content for members and non-members, we're raising our visibility within the modeling community. Currently all three of those social media sites are managed and administered by a group of volunteers, but the best content comes from you, our NMRA members. All NMRA members are encouraged to join in and participate in the NMRA's growing social media presence. You'll have a lot of fun, you could learn something, and it will benefit the Association as a whole. If you don't have a Twitter or Facebook account, signing up is easy at www.twitter.com and www.facebook.com. Once you're a member, search for @nmraonline on Twitter and click "follow," or search for National Model Railroad Association on Facebook and click "Like." Both sites display the NMRA logo, so you'll know you've found the right place. Then...join in the fun and add some comments or posts! Never been to a national convention and wonder what goes on there? Have friends who ask what you do at a convention for a full week? We now have the answers in a video on our website! Vice President/Special Projects Gerry Leone, MMR, produced a special video entitied "What goes on at a national model railroad convention?" Click on the large picture at the top of the homepage on our website and you'll be taken to a page that allows you to view each of the 13 chapters of the video. Chapters include "Clinics," "Layout Tours," "Prototype Tours," "Modeling with the Masters"and much more. If you can't go to a national convention but were wondering about the goings-on at a Regional convention, there's even a chapter about that in the video. The video was shot at last year's Portland Daylight Express and is viewable by NMRA members and non-members.